Cape Mountain Zebra is a subspecies of the Mountain Zebra that is unique in many ways. Its white stripes are typically more narrow than its dark stripes, resulting in overall darker appearance. Unlike other species of Zebra, the Cape Mountain Zebra is unique in its sexual dimorphism – the females are bigger than males. They inhabit bare hills and sparsely wooded uplands of the Eastern Cape province in South Africa. Cape Mountain Zebra is one of the most exclusive kinds of zebra. Found only on a limited number of preserves, the shooting fee for one may be as high as $2,500-$5,000. The daily rates, and perhaps the price of a few other trophies (few hunters go to Africa to hunt just one species), will have to be added to the price of the complete hunt. When to hunt Cape Mountain Zebra? Hunting in South Africa is open all year round. 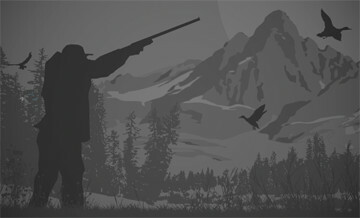 Most people prefer the southern hemisphere winter months (late May to October) for plains game hunts. However, in the provinces where the outfitters that offer most of Cape Mountain Zebra hunts are located, the temperatures are usually not too punishing even in December and January. Cape Mountain Zebra prefers open hillsides with grass for grazing and waterholes not too far away. They live in limited family groups, harem (with one stallion and a number of mares and offspring) or bachelor. While mares are usually bigger than stallions in Cape Mountain Zebra, from the environmental and fair-chase perspective it is probably better to target a bachelor group. Spot-and-stalk is the preferred method of plains game hunts in South Africa, but bowhunters may choose to wait for the animal in a ground or elevated blind over a waterhole. Cape Mountain Zebra was once brought to near extinction by uncontrolled hunting and habitat loss. Today it is listed as Vulnerable, with the free-ranging population in the Zebra Mountain National Park very small and not sufficiently genetically diverse. Herds kept on game farms are essential for the species’ survival, both in terms of numbers and supporting genetic diversity by selective breeding. And game farms depend on hunters’ dollars. This is how the money you pay for harvesting a selected individual goes towards preservation of the species as a whole. Something to ponder as you look at the unusual, with more prominent dark than white stripes, skin on your floor or wall. We are your ticket to adventure through scenery that will take your breath away and thousands of hectares of superb hunting ground just waiting to be explored. If you are looking for a once in a lifetime opportunity to hunt one of 50 game species on a private reserve of 20 000 hectares, you have come to the right place. South Africa is a hunter’s paradise, for the seasoned safari hunter, who is looking for specific species, or the first time African hunter you who want that first African experience. It is the one country that can offer all of the big five as well as an impressive list of plains game animals. Any tour or hunt/tour combination can be made up to meet the clients needs. (for example: 6 days of hunting and 6 days touring).